Any musician can appreciate the elegant and sleek design of this sheet music stand. With many hours dedicated to design and production, this piece is truly one of a kind. Standing at roughly 4'5" it's the perfect height for most musicians. Say goodbye to your boring stand that just sits there; this piece will add modern style and elegance to any stage or music room. 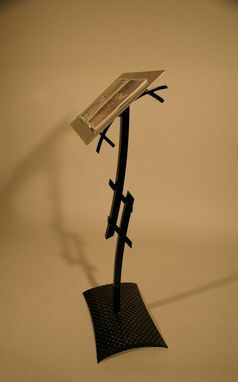 Constructed with high quality metals this stand will handle all types of wear. Each part of the stand is seamlessly welded with precision and quality to ensure the longest life possible. Quality and style are the best words to describe this.